I've come to realize that, while many companies engage in the various forms of media, very few know they should interrelate and even fewer understand how they interrelate. Let's see if we can fix that for some of you. Happy New Year and welcome to our first series of the year. Anyone in marketing knows the three primary buckets of media: paid, owned (or controlled) and earned. 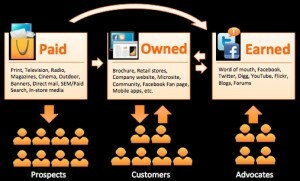 Many in marketing know that social (or shared) media is a hybrid of owned and earned. Over the past year since we launched our inaugural strategic media program, however, I've come to realize that, while many companies engage in the various forms of media, very few know they should interrelate and even fewer understand how they interrelate. Let's see if we can fix that for some of you. Footwasher Media approaches media and content on a scale of trustworthy to suspect. On the trustworthy side of the scale is earned, followed by social. On the opposite end of the scale is owned and paid. In this post we're going to focus on the latter. Owned is content you create and distribute directly. That includes collateral material, trade show efforts and even your website. Because it is wholly owned and managed by you it is the most controllable and measurable. You may bring third parties into the creation of the content, but generally the real expense is in the building of the delivery mechanism in the form of web design, SEO and graphics. You are the sole arbiter of the content and success is wholly dependent on your ability to attract an audience and get them to accept what you say as true. Paid media is generally advertising or pay-for-play media, paid for by you but distributed by a third party, generally a media engine, like a magazine, news website or email service. It is much more expensive than what you would put into owned content, but if it fails to produce expected results it is easier to blame the delivery medium and the creative agencies you engage. Both of these forms of content are highly suspect by your audience/customers for the very reason that they know it is one sided. You are trying to get them to buy your product or service and you are fudging the data to your benefit, even when you completely believe that the data you are offering is legitimate. Of the two, paid content is the most suspect and unlikely to convince someone already doubtful of your argument. Paid content is most successful when targeted at customers that have already made up their minds to send money your way. It reinforces and justifies their decision creating the opportunity for a repeat sale... unless you really screwed up. Owned content is also suspect but it is much more passive than paid content. A magazine or banner ad on a third-party website is intrusive, but a potential or current customer chooses to come to your website or show booth because they want to know more. They are already inclined toward deciding for you by this choice. Whether they make the commitment, again, will be based on the persuasiveness of your argument. In our next post, we'll look at trustworthy content.